In case you've been so caught up in RealID drama to ignore the other happenings on in gaming news, Valve released the final class update for Team Fortress 2 yesterday following an interesting promotion. The Engineer update also came with a few new maps, including a new Payload Race map, plr_hightower, and it looks like Valve finally figured out how to make PLR fun. 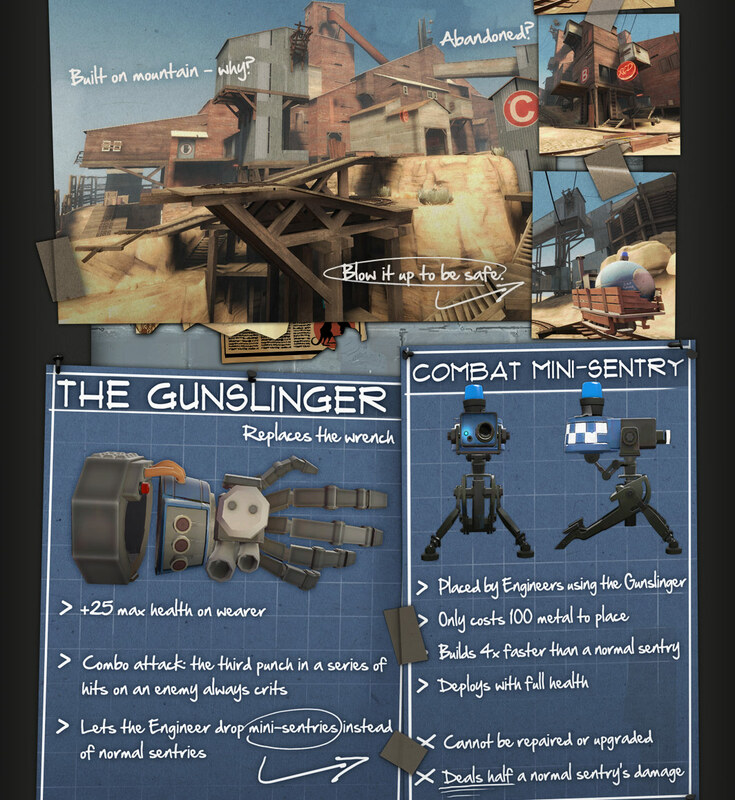 The update focused on adding new weapons and features to the Engineer class with the goals of untethering the player from their buildings, particularly their Sentry Gun, and increasing Engineer mobility altogether. The update hits the mark perfectly; I haven't even played the new Engineer yet, but I love all the new choices presented. A big issue with typical class updates is that the class gets overplayed. We have class caps (limit 4) on our server, but I have no qualms with more teleporters and dispensers! The first enormous change (that doesn't involve acquiring new weapons) is that Engineers can pick up and redeploy buildings now. If an upgraded building is redeployed, it begins life as level 1 but instantly starts upgrading itself to its old level right before the Engy's eyes, without any input or metal. To redeploy a level 3 Sentry Gun takes maybe 6 seconds. There were plenty of times last night when I rounded a corner to find a level 3 SG there when only moments before there was nothing. One problem with the old Engineer was how reliant the class was on its Sentry. If destroyed, typically the Engy was in hot water. Well Valve added a new shotgun called the Frontier Justice that shoots "Revenge Crits" after the SG is destroyed (even if blown up by the Engineer himself!). For every kill the Sentry gets, the shotgun stores 2 Revenge Crits; for every assist, 1 crit. The downfall is that the Frontier Justice has half the magazine size of the normal shotgun (3 versus 6), and doesn't receive normal crits. If planning isn't your thing, you can equip the new melee weapon, a mechanical hand called the Gunslinger. It provides an extra 25 Health to the Engineer, guarantees a crit on the 3rd successive melee strike, and let's the player deploy a Mini-Sentry. This cute little tripod costs only 100 metal (versus 140 for the normal SG), builds 4 times faster, and deploys with full health. Problem is that it cannot be repaired or upgraded and only deals half the damage as a normal Sentry. This certainly helps the Engy be more offensive. Another game changing weapon replaces the pistol and is called the Wrangler. Activating this device let's the Engineer take control of their Sentry, letting them aim the stationary gun with no range limits and fire at double the normal rate. A laser originating from the Engy points to the target, and the Sentry gains a damage shield that absorbs 66% of incoming damage. Should the player die or deactivate the Wrangler, the SG becomes inactive for 3 seconds. Previously infeasible sentry locations and now usable since Engineers can overcome the range limits. There is also another wrench you can find which adds a bleed effect to victims, making pesky Spies easier to dispatch. I think it may be too soon to tell if the game has completely changed. Very rarely does anyone do the typical Sentry turtling, but that may be because of the novelty of the update. The game does feel fresh though, as many people are trying out crazy tactics and enjoying all the new options. Perhaps I'll go play some more TF2 now that they've actually finished the classes. See how the "real game" has turned out. I think it's unfair to say that TF2 was incomplete simply because Valve decided to augment the classes over a series of updates. The game was whole even before the first of the class changes. That update was actually named the Gold Rush Update after the map that accompanied the patch. The new Medic weapons and achievements were a way to promote the (underplayed) class. Does the game play a bit differently after an update? Sure it does--that's the point of balance changes! And old Engineer was never boring to play unless you sat in the basement of 2fort-only servers. Would you say that LotRO's classes were incomplete or not given their full ability sets? I think the real question here is: did adding the Runekeeper and Warden classes significantly change the dynamics of the game? I think it did, but that's kind of what we expect from an MMO expansion. I think a better MMO analogy would be: what would have happened if instead of raising the level cap to 65 for all classes in "Siege of Mirkwood", what happened if Turbine had raised the level cap for a single class every month or two. Pretty much the exact same thing that happened in TF2: people are going to flood playing a single class for that time, and the slight (but not overwhelming) edge in power would dominate for a bit. I haven't played the update yet, but it sounds like the Gunslinger glove is a HUGE change in Engineer strategy, allowing a much more offensive playstyle. Is this going to change the game forever? Maybe, maybe not. But, it does present a significantly different option than when the game launched a while ago. This is more than mere balance changes, though, this is adding significantly different gameplay. Obviously I'm not necessarily expressing a majority opinion here. Lots of people seem to have enjoyed the class updates. It just struck me as an odd way of handling it for an FPS. You seem to be confusing sidegrades and mutually exclusive abilities/weapons with explicit power gain (RPG levels). Every weapon that has ever been added has a drawback and let's players customize their loadouts based on style of play, team composition, and tactics. These weapons are not added to a class' weapon selection without replacing something else. A Medic may choose to equip the Kritzkrieg, but he gives up the regular Ubercharge. A Sniper can replace his automatic rifle for a jar of piss or a backstab shield. People overplay the classes given attention in the updates because of the Achievements and novelty of the new weapons. It has nothing to do with increased power. I've played the update a little as a demo. The first night I easily beat my record for buildings destroyed in one night. I also created 2 posts for the first two days of weapon reveals. The posts are in the for of a market spiel. Fun to write and also, hopefully, fun to read. Check them out from the links below. Never played the original TF, but as much as I've read, it sounds much better then TF2. 'RP' (what? I have to level up for the good items? Sorry but I want to play a FPS), 'CRITS', and general casualisation makes TF2 a disappointment for myself and no amount of memes can fix it. Not to say it isn't a fun game, but that is all it is... A fun game, it will never be taken seriously like the original TF was or like CS is. TFC and TF2 are two different games. This is the same reason I cite when I explain to people why 2fort is a terrible TF2 map. If you are looking for TFC with updated graphics, then you've come to the wrong place. Just because they are different does not mean one is better. To clarify a few things: TF2 has no levels; it doesn't even have experience points. Items are found by just playing the game or by unlocking Achievements. Not all crits are random. There are some triggered buffs that provide crits, creating tactical choices. And if they pester you to no end, you'll be happy to know that most competitive leagues turn off the random ones.